Common, strikingly beautiful shrub with intense orange and red flowers. Young seeds are edible (remove seed coating before eating) and taste like peas (plant is in pea family). 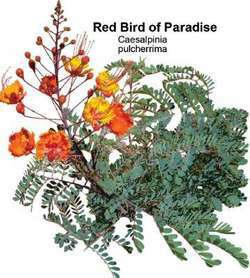 NOTE: Its close relative, Caesalpinia gilliesii (Yellow bird of paradise), is also a common landscape plant and can be distinguished by its yellow flowers with long red stamens. The seeds of that bird of paradise are poisonous and cause severe irritation of the digestive tract! Medicine men use it, but normal people should leave it alone. This is in addition to the Nerium oleander (Oleander - Tree form), Caesalpinia pulcherrima (Pride of Barbados) and Jatropha pandurifolia (Coral bush). Brassicaceae] Lipaphis pseudobrassicae Caesalpinia pulcherrima (L.
By using less-thirsty plants, such as dwarf oleander and Caesalpinia pulcherrima on the edges, and Trachelospermum asiaticum in the shade of the Arizona ash (in California, substitute Raywood ash), they were able to imitate the look while using little water.